Happy holidays, folks! Shopping for the foodie in your life, the entertainer, the wine/cocktail lover? Whatever their pleasure may be, we have a feeling they’ll be delighted by any one of these things! The coffee lover? Check! The cheese connoisseur? You betcha! Those that love to entertain and host parties? Ohhhhh yes! 1. Agate Cheese Board ($78.00) — Available in a variety of colors, this unique cheese board is the perfect way to offset the products of the earth. *Currently on sale for $62.40! 2. Truffle Salt ($28) — Give the gift of flavor…Italian truffle flavor, that is! This flavorful salt is blended with shaved truffles and adds an elegant touch to risottos, roasted veggies, meats, and pastas! 3. ‘50s Retro Style Espresso Coffee Machine ($449.95) — It makes darn good coffee + it’s adorable, need we say more? 4. Magnolia Table: A Collection of Recipes for Gathering ($14.99) — Oh Joanna Gaines, how we long for a spot at your table…but until that time, we’re all for sampling your recipes + Gaines family favorites! 5. Black Electric Pour-Over Kettle ($169.95) — How chic is this matte-black electric kettle? Jen + Jason have this kettle and use it everyday. Enjoy a slow, steady pour thanks to the precision spout! *William Sonoma Sale! 6. Chemex 10-Cup Pour-Over Glass Coffee Maker with Wood Collar ($45.95) — You really can’t go wrong with coffee anything! This coffeemaker is elegant—making a pretty piece for your counter—but it also yields a really good cup of joe! We use this as well everyday! *William Sonoma Sale! 7. Brunch Lady Retro Fiberglass Tray ($21.00) — Vintage design meets modern twist, with just a *touch* of sarcasm. How cute is this dusty pink tray, perfect for breakfast in bed or dishing up delights for your pals! 8. Orb Cocktail Shaker ($24.95) — Embrace the decadence and nostalgia of vintage cocktail culture and elevate your home bar! *Currently on sale for Black Friday: $19.96! 9. Chic “This One’s For My Homies” Beer Glass ($12.00) — Drink a pint of brew in this adorable glass and we have a feeling it’ll taste even better than usual! 11. Le Creuset Graphite Dutch Oven ($340) — Because no kitchen is complete without a good cast-iron Dutch oven, right? 12. Lady & Larder Cheese Board ($299.95) — Okay, so first things first: it’s GORGEOUS (hello, photo ops!). This premium selection of artisanal meats, cheeses, and dried fruits is a seriously show-stopping and mouthwatering arrangement that is sure to bring everyone round. 13. Vitruvi White Stone Essential Oil Diffuser ($119) — Whether this is placed in your living room, or on a nightstand, this sleek essential oil diffuser is a serious essential. Blend herbs and other aromatherapy scents to create a space that enhances your mood, your guest’s mood, and your overall well-being. We own this as well and not only works great but looks super chic in our home. 14. Black Marble Wine Cooler ($44.95) — Keep your wine cool with this ultra-cool marble cooler! (How many times can we use ‘cool’ in a sentence?) *Currently on sale for Black Friday: $35.96! Check back tomorrow to find our present picks for your bestie, mom, or sister! 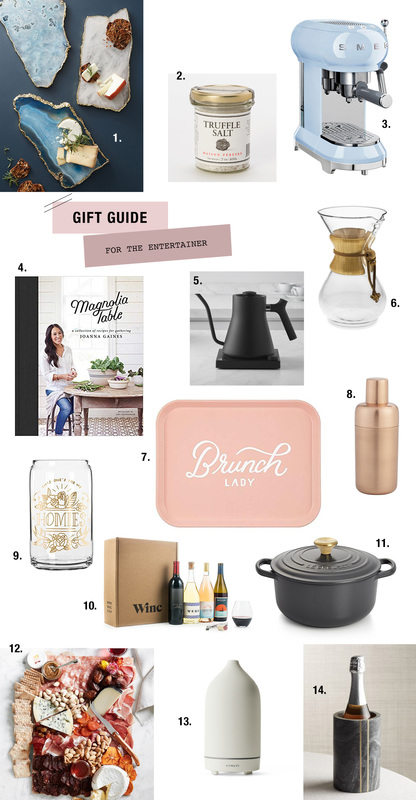 Also, if you want to see even more ideas of what we’re loving this year, head over to our Pinterest page and find our extended Gift Guide for the Entertainer picks!